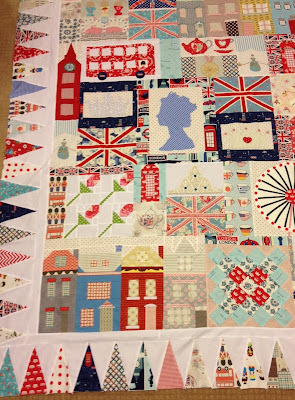 I almost can't believe my summer London 2012 quilt top is completed. I have enjoyed this project immensely but I'm ready to move on now that the Queen is back in her throne, Olympics are over and summer vacations are a nice memory. I am really pleased with it. At one point I became discouraged with fitting all the blocks together with the filler fabrics and having it all come together and look like a cohesive project. It sat on my sewing table for several weeks without much progress. But then I rethought measurements and pushed forward. I like my banner border. The binding will be like the string holding the bunting inline. It is a busy quilt but I think there is enough white to give the eye some rest. I placed my town/row homes on the top and bottom corners to anchor the quilt. I've even decided those 4 roses together really suit better to be torches. So now they are officially representing a bit of the Olympic torch cluster. Each little piece of the quilt has taken quite a bit of thought and planning. And each piece means something to me. Several of the blocks were taken from ideas of other patterns or from parts of patterns I have obtained from others and some are ideas I just imagined. I think my favorite block is Queen Elizabeth's silhouette that my good friend Pam Kitty Morning let me use after I saw her make a pillow with it on her blog. The next step is quilting. I'd like to get it done (of course) as fast as possible. I'm going to make some calls today to see what I can come up with. I can't imagine my pleasure with it when it is quilted and bound. I will really enjoy this as a memory quilt and the quilting focus of my 2012. I would like to move onto several UFOs but my daughter Tracey and her husband Eliot are moving into a new home and of course they need a new quilt. So that will be my next quilt. 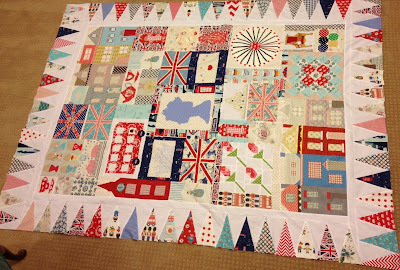 Ideas began to form for that project as I stitched the last few seams of London 2012. I love your quilt! It is so beautiful, and I don't think too busy at all. You are very talented! WOW, das sieht ja supertoll aus!!! Amazing! It is so beautiful. I love the whole thing but I think my very favorite part of it is those houses! Your quilt is absolutely gorgeous!! Truly!! What an amazing work of art!! Absolutely F-U-N!!! Cohesive, well-balalnced, and not at all busy. Love the colors! it's so unique and you can tell tons of thought went into it. FAB.U.LOUS!!! Nanette - I couldn't love a quilt more. What a masterpiece!! Not only that but I adore the subject matter!! Each and every block is a story. Can't wait to show my UK loving sister! It runs in the family. Its awesome!!!! Love it Nanette! Way to go, Nanette!!! I think this is your prettiest quilt yet, and that's saying something. ALL of your quilts are pretty, but this one is just above and beyond. I know you're going to enjoy it all over again every time you see it. This is an amazing quilt! With so much love put into it, it's a treasure. This quilt is so GREAT! I just love the houses and that Ferris Wheel is so amazing! WOW!!!!!!!!! I hope you can hear me saying that :-)!!! It's just amazing!!! I couldn't wait to see it finished! I love the banner border it really makes it pop. It is so neat. I hope to be able to plan and execute something so unique some day. I can't decide which is my favorite block. Thanks for sharing. It's just gorgeous Nanette...I'll bet it feels so good to have completed the top. I know so much time went into it and it has all been worth it. I especially love the banner border...I think it surrounds all of your amazing blocks just perfectly! Boo hoo. While I'm happy for you that your spectacular quilt is done, I'm a little sad that the journey is over. I've loved seeing the pictures as the blocks were being completed, but I especially enjoyed reading about your process along the way. I will keep my fingers crossed that you can get it quilted and bound and truly finished soon so I - okay, we - can enjoy your amazing quilt just a little longer. Wow Nanette. Wow! It turned out great -- what a fun memory. I LOVE the Eye and the "bunting" around the border is genius!!! Gorgeous! Absolutely beautiful! You really made that fabric work and sing. Oh, Nanette, it turned out absolutely fabulous. I love, love, love it! Will you be making a pattern at one point? I know you gathered ideas from many areas, but the overall effect is so Nanette! Oh.My.Goodness!! That turned out even better than I had imagined, Girl!! It is WONDERFUL!! What a treasure. I think you should send it to a magazine! That's a real beauty! I really enjoyed watching it come together as you worked on it and posted on your blog. What an incredible one-of-a-kind quilt. Congrats! Oh, my, it is gob-smacking fabulous!!! What an awesome quilt and one that I am sure the Queen would love, too. 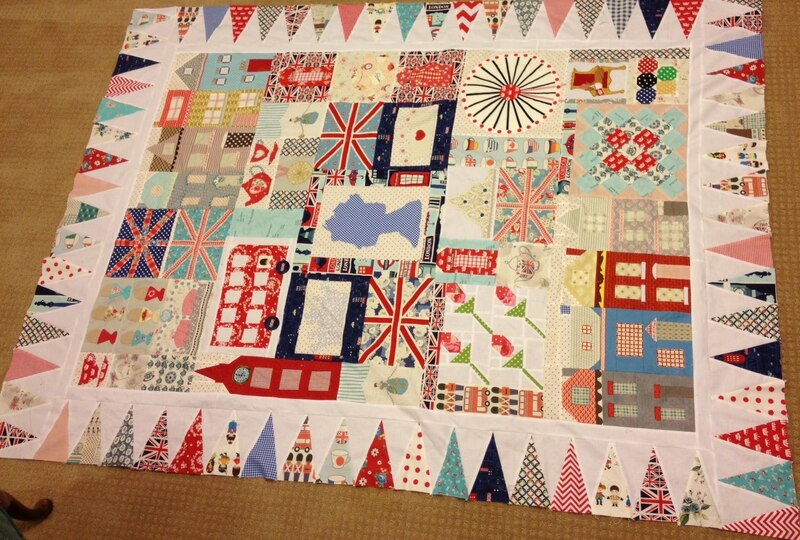 Some British Patchwork magazine really needs to feature this quilt and tell it's story. You captured all that is Britsh. Excellent work and a real treasure! That`s a fantastic quilt, my husband is Englisch and i`m dutch and he thinks it`s very nice. adore, adore, adore!!!! You are so creative! Astonishing!!! You must be so proud of the quilt top. It really seemed a labor of love. I love the border and I think my favorite block is the corgi one. It's been so fun following your progress with this quilt. Really remarkable! Gorgeous, Nanette! It has your personality all over it. My mother is a huge royal fan - I'll be sending her a link to this post! Love your idea for the border. I have been waiting to see this finished quilt, I just knew it was going to be awesome! I LOVE IT!!! It's so happy and bright and I have enjoyed watching your journey making it. You're so creative, and inspiring. Hugs!! looks great. congrats on getting it together. I love looking at each block. love the egg cups. It's just wonderful. I'm glad you finished it! Waaaaay cool, Nanette! I love it and what a commemorative keepsake. Outstanding! I'm with the others, I would love you to write up the pattern!! Add me to the order list if you ever do!! Please!! I love it! between the beautiful fabrics and the unique blocks, this is a feast for my eyes! It's beyond gawjus Nanette!!! I just love it, what a fabulous quilt :o). Congratulations on the finish! The quilt is just EPIC... Absolutely wonderful in every way! OHMYGOSH I CAN'T BELIEVE HOW FANTASTIC IT TURNED OUT. Honestly, I'm totally awed by it. Really amazing, what a vision and it came together so perfectly. this is an INCREDIBLE quilt! I have been a bit (ok more than a bit) London obsessed this year and hubby & I even took a trip over there this summer to celebrate our anniversary. I love what you have done! Oh Nanette, it's fabulous. What a fabulous keepsake. I know you have children, but would you consider an older child adoption? I need to live in the same house as that quilt. I'm 55, well mannered, have my own sewing machine (4 actually) and I can cook. Nanette...you are amazing...it is spectacular...just stunning. Every element is just perfect...I've come back to look at it a few times today! What a wonderful tribute to this summer and to your heritage! My sister LOVES this quilt! You should create a pattern!!! 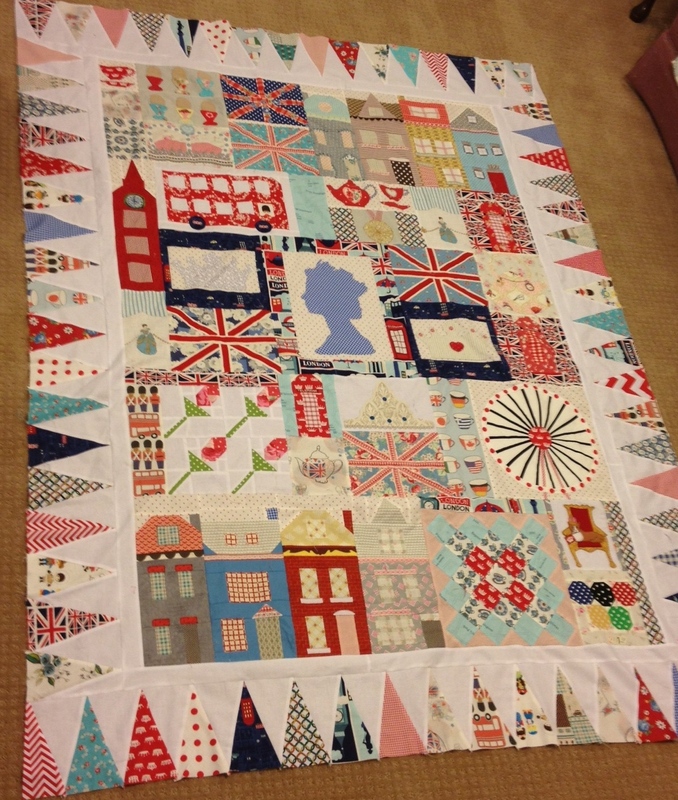 What a wonderful creative journey you took to London this summer--love the finished top and have a lot of favorites besides the queen's portrait...especially the Tower, double decker bus, and all those teacups and flags. It looks amazing. Congratulations on getting it all to fit and flow! Congratulations. I LOVE your quilt. The bunting border looks awesome. Fit for a queen Nanette. I love this so much and you are correct, it is busy, but also very detailed. I think it is the white that does it. Love, love, love it! Everything works so perfectly together. Nan, this is just wonderful!!! I love the idea of the binding being the string for the bunting. Just fabulous!! This quilt is just fantastic Nanette! I wouldn't have imagined it so spectacular. The border is amazing too. I love the symbolicness of it! This quilt is fantastic and is a wonderfully creative design. I am so glad that you were able to problem-solve and move forward. 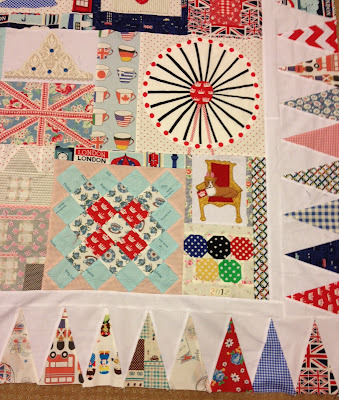 The bunting border is perfect. the best compliment I can think of is to tell you that if you sold the pattern I would be the 1st in line to buy it! It is a heartfelt design and easy to see that you put a lot of thought into every aspect of the process. FANTASTIC!!! I have been watching your progress and awaiting the finale!! You sure didnt disappoint!! LOve, love love it!! I am so jealous!! Wow Nanette! It is so wonderful. Love all those blocks & the colors. Can't wait to see it quilted & bound. Congrats on an awesome finish! Have a great weekend! Oh it is fabulous! I just love it and can't wait to see what it looks like once it is all quilted. I love it and am totally jealous that it is not mine. 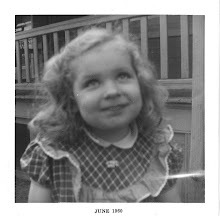 I have had a hard time checking in on my bloggy friends since i am now a working woman. I am glad to see that everything is going well and Eliza is darling with those eyelashes. Remember that you are AWESOME!! Your quilt is just stunning! I love it! You've done a fantastic job! Your quilt is absolutely lovely and gorgeous!!! It is a real tribute to your love of England and talents. Well, I think you just out did yourself on this one Nanette!! It is much harder to put a quilt top together without a distinct pattern to go by!! See, you can be LIBERATED TOO!!! 2 'cheerios' and 1 'ole chap' rating! It is incredible!! You put it together fantastically! 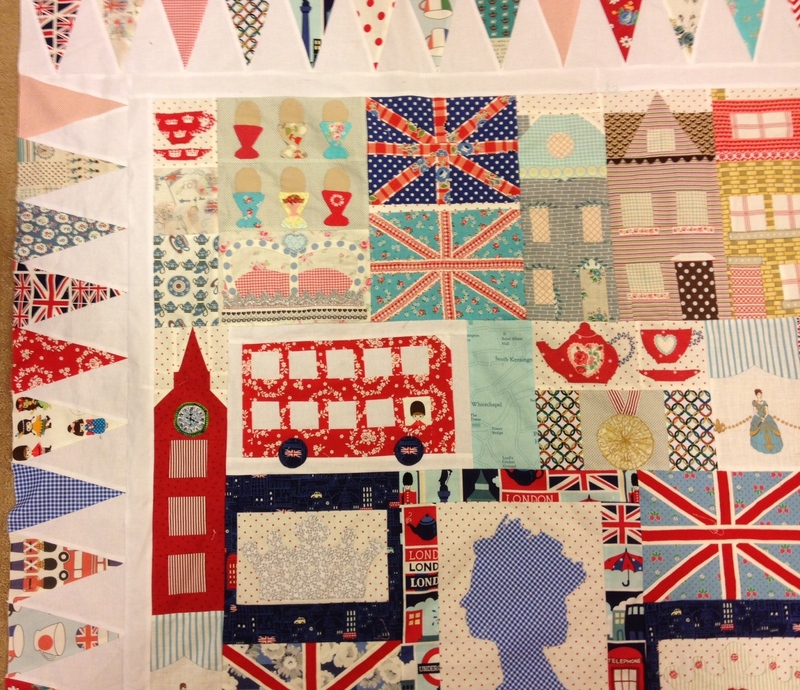 Love the bunting border too, so clever! This looks amazing - you should be very proud of yourself! The bunting is just perfect. 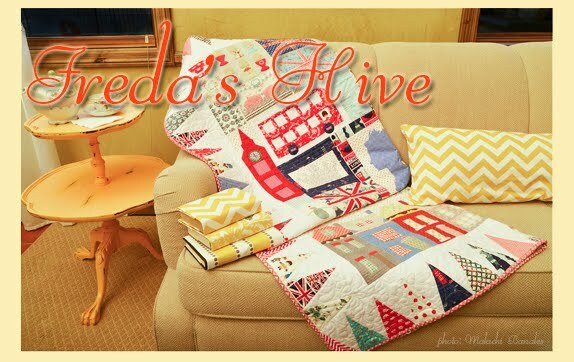 I am behind in my blog reading but I loooove this quilt! How fun! I just love your quilt. Everything in it fits together so well. This quilt will never bore. Absolutely marvellous quilt. It is a wonderful journey of discovery to look at and enjoy. You can feel proud of your achievement. Not too busy. Just a bunch of FABULOUSNESS! You inspire me!!! What an amazing quilt you have really captured London 2012 ! Oh my gosh, this is the most beautiful quilt. I love all of the elements. It must have taken FOREVER! This is a great example of a modern quilt that has such a great inspiration that I'm sure it will be passed down for many, many generations. Beautiful binding too. Your quilt turned out great! I love how your border pulls it together. It's perfect! amazing! I love the little corgi the most! This quilt is simply amazing...absolutely stunning. I realize I am terribly behind the times, but I just love this quilt. It has a special uniqueness with customized bits here and there, but nothing over the top. Hope it's brought you lots of great memories, even if not a trip to Merry Olde England. This quilt is incredible! 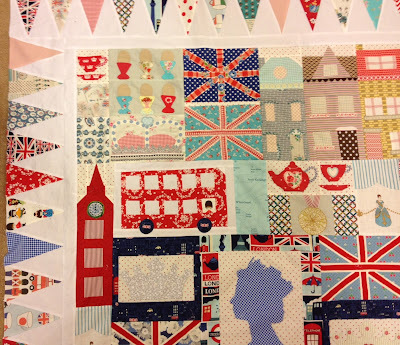 I love it- just searching for an idea for a quilt to make my England obsessed mother and came across this. yours is out of my skill level but wow- thanks for sharing it!